We sat down with Nia Thorpe, a primary school teacher, yoga teacher and curator to ask her all things Yoga! Have you always been a yoga instructor? No! I’ve always been a teacher but not just yoga. I am a Primary school teacher, education curator and yoga instructor. Sounds like a funny mix but it all works and each supports the other. How did you get into yoga in the first place? I started very young, when I was in the womb in fact! I had a fairly regular led practice throughout childhood (mainly through a play-based approach to yoga) and my teens. I started my own self-practice at university, 17 years ago. What do you most like about yoga? I like it because I can be still and I can move. I like it because it can be restorative or energising. I like it because it is simple whilst deep. I like it because it can heal pain plus prevent pain. I like it because it is a conscious connection of body, of mind, of the soul. I like it because after my practice my whole life, on every level, feels better; I connect and cherish those around me more; I am much more aware and appreciative of nature; I am open to the universal questions, theories and patterns of life… every level of my being is brighter! When did you decide to dedicate yourself to yoga professionally? Ever since I started teaching children 6 years ago I have been incorporating children’s yoga into classroom learning and have developed teacher training/ resources to support other colleagues to do the same. Children are natural yogis and benefit greatly from all that yoga has to offer. 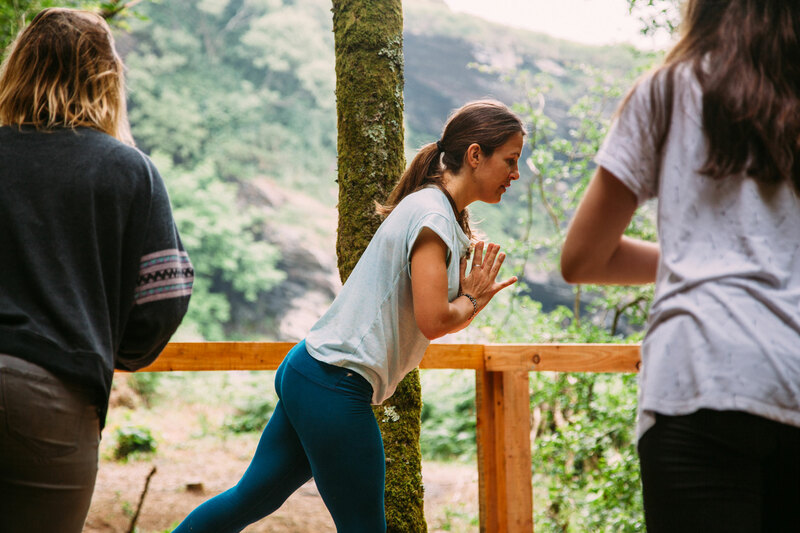 In my mid-twenties I did a British Wheel of Yoga teaching diploma whilst working in gallery education, I did do some basic adult teaching then but it wasn’t until last year that I decided to embark on my 200hr Yoga Teacher Training. I’m glad I waited as I was fortunate to receive such amazing training from Rachel Brathen and Lara Heimann at Island Yoga in Aruba last November (2017). Why do you think some may feel intimated by yoga? How can they overcome this? I’m genuinely not sure why people may feel intimated by yoga as for me it was something I’d experienced from young and it feels so natural to do it, babies are doing yoga all the time, my Gran at 90 has done yoga with me, anyone at any age can do yoga! I suppose it has got certain cultural connotations or we have been conditioned by media or hype. Conceptions could be that physically you have to look a certain way, or spiritually you have to think a certain way, or mentally you have to not think at all or that you only go to yoga if you are a certain type of person or maybe you have a health professional advising them to go and you wouldn’t choose it for yourself so are feeling unattached. I don’t know really, and I have thought about it and encountered a lot of misguided apprehensions. I do think most people see a new thing to ‘do’ as a challenge to their ‘known’ experiences, it’s only through experience and honest, loving guidance that people trust so I suppose I would say find a good teacher, have a go and see for yourself if you like it or not, you never know you might just stumble upon a wonderful experience! What do you find rewarding about being a yoga instructor? That I can bring joy to people’s lives – I’m not saying the yoga that I teach doesn’t have demands… it does, believe me, but that it’s all worth it. The work you put in will always be worth it. Bringing joy and brightness to the people around me the is the most awe-inspiring and motivating thing. I am so grateful to guide people through a yoga practice. Can you tell us a little about your yoga classes at Kudhva and what we are to expect if we come to a class? I lead my teaching practice from a place of authenticity and ask that no one judge themselves on what they think yoga is or what a yogi should look like. Most of all I want everyone to feel valued and practice self-love through reflection, commitment and kindness. In all classes I will lead students through a grounding and intention setting, often with a breathing exercise; we will then warm up our bodies and build heat slowly through a sequenced flow of breath/body movements; once we’ve reached optimum heat we may try some fun and focused led balances or inversions for strengthening and some longer hip, shoulder or heart openers to release; we will then slow down our heart rate and allow each cell of the body to enjoy a tide of refreshing energy to wash in during a deep relaxation. I weave intention setting, metaphor and music into each class I teach providing students with the opportunity to use their imagination and feelings of connection. Essentially, I want each student to feel willing and present, the flexibility and strength will come with practice. What type of yoga is it? A blend of Vinyasa flow (movement with breath) and hatha (traditional still poses). Sometimes if the mood is there I might teach a Yin based class, which is slower and deeper. To note, if I use Sanskrit I will always use English first, I will always provide modification for injuries, medical conditions and different abilities. I try to stick to an hour of teaching – with 5 minutes of an intro (for reflection) and 5 minutes of closing (for take-home ideas!). Come dressed to move, sit comfortably and bring a layer for relaxation. Wear walking shoes/ sandals as you may need to explore nature to find us. We will have mats and water but feel free to bring your own if you prefer. You could also bring crystals, mala beads, a towel- whatever your vibe is that day! How many sessions will you be doing at Kudhva? I ran some sessions at Kudhva throughout the summer and my next classes will be this September! My first class will be on Saturday, September 8th 2018, then on the Saturdays following that for the duration of September! 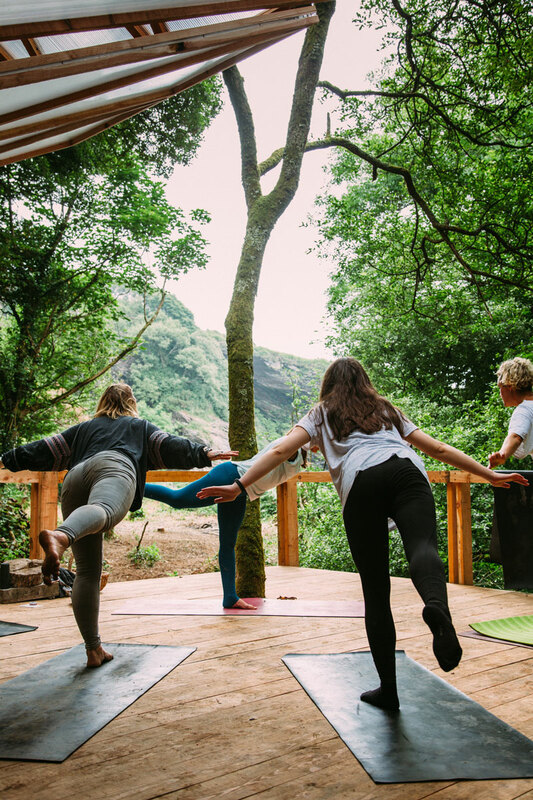 There’s something pretty special about teaching yoga in the outdoors, would you say that beauty of the natural environment around you inspires your practice? Most definitely. 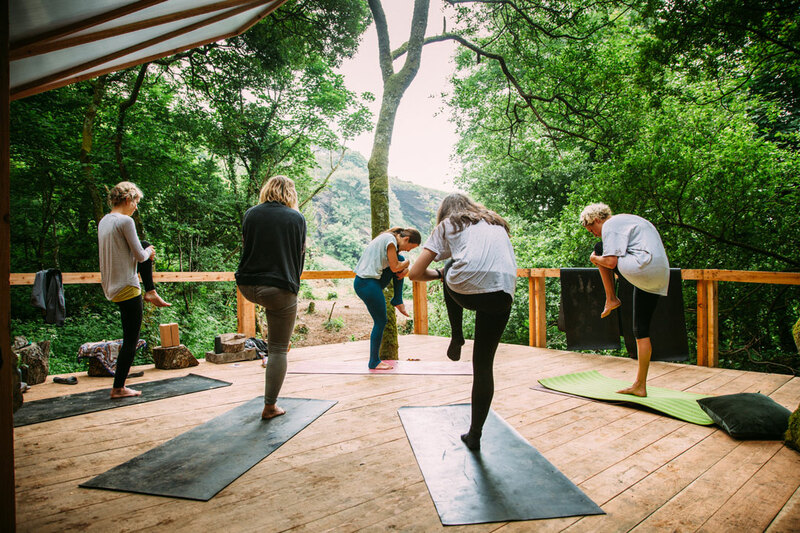 Practising yoga with a view of nature, under the trees, besides a river or on a beach are my absolute favourite places to practice. I enjoy the humbling opportunities that the earth or sand under my feet may present me, the sounds that could uplift me or the views that can soften me. Nature is enchanting and I feel most myself when out in it! Tell us about your favourite, most adventurous locations where you’ve done yoga. On a beach under a super full moon in Aruba, beneath a rainbow on my roof terrace in Greece, on a SUP in a lake in South Africa and in between the wild trees at Kudhva, Cornwall of course! What piece of advice do you wish you could tell your younger self? To believe in myself, truly. To love myself, wholly. To trust that ‘all is well’. Do you have any plans or goals for the future, either personally or for your yoga? Personally, to practice yoga every day so I can show up brightly; full of hope and positive energy for our world and its people. Professionally, I want to develop strategic ways to help offset mental health issues by continuing my work with yoga and wellbeing in education.